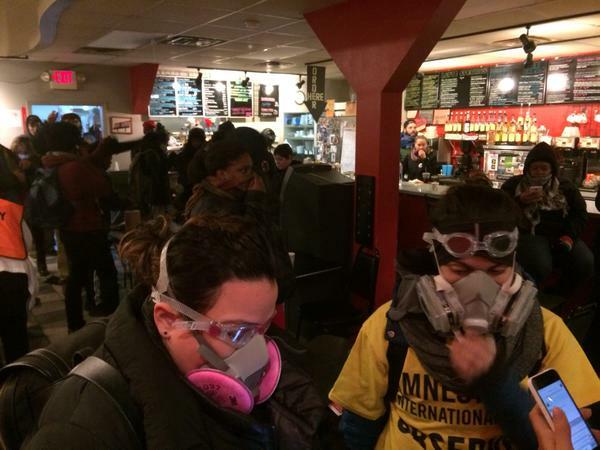 Barbados-born superstar Rihanna Tweeted this photo last night after the Ferguson verdict. News Americas, NEW YORK, NY, Tues. Nov. 25, 2014: While hundreds protested in the streets of Ferguson, Missouri, New York, Los Angeles, Seattle, Philadelphia and Chicago Monday night following the announcement that a grand jury in St. Louis County brought no criminal charges against Darren Wilson, a white officer who shot and killed unarmed black teen Michael Brown this summer, Caribbean celebrities took to social media to voice their own disgust. “ #stand with her and #pray for #peace across America,” Ralph added. 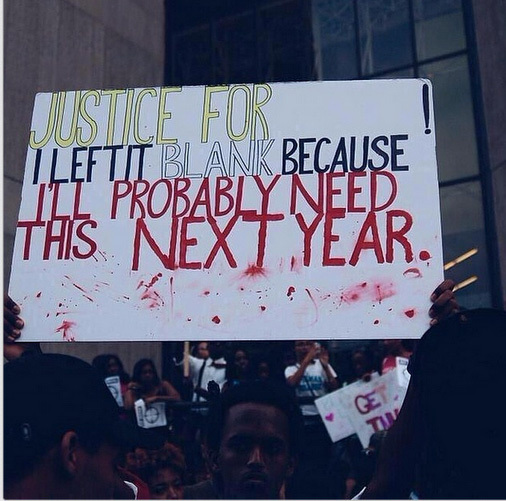 “So sad by this verdict smh #FergusonDecision #WeMatter #keepourheadup,” she added on Twittter. Actress Megan Goode and Stacey Dash, whose roots stretch to Barbados, both also weighed in on the verdict. 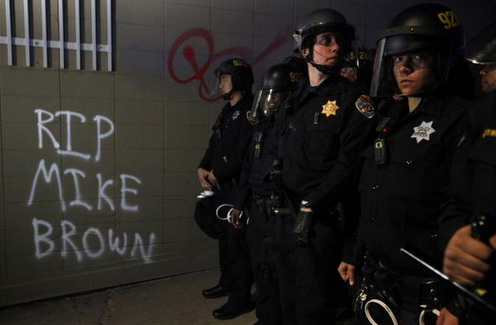 @LeahMillis posted this from Oakland. St. Louis County prosecutor, Robert P. McCulloch said at 8 p.m. central time Monday night that Officer Wilson had faced charges ranging from first-degree murder to involuntary manslaughter. He said the jury of nine whites and three blacks failed to indict Wilson. Brown’s family issued a statement expressing sadness, but called for peaceful protest and a campaign to require body cameras on police officers nationwide. President Obama also appealed for peaceful protest and “care and restraint,” even as he said the situation speaks to broader racial challenges in America. But the news set off a new wave of anger. Bottles and rocks were thrown at officers and windows of businesses were smashed. Several police cars were burned; buildings, including a Walgreens, a meat market and a storage facility, were set on fire, and looting was reported in several businesses. 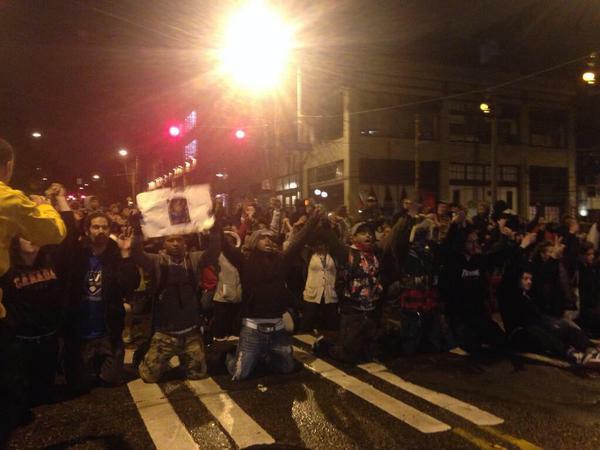 @grasswire posted protesters kneeling in support of Ferguson protesters in Seattle. Jon Belmar, the St. Louis County police chief, said at least a dozen buildings had been set on fire. Gunshots could also be heard along the streets of Ferguson, and law enforcement authorities deployed smoke and gas to control the crowds. In St. Louis, protesters swarmed Interstate 44 and blocked all traffic near the neighborhood where another man was shot by police this fall. Police said 29 people were arrested as of late last night.